Games by Jake Elliott, Tamas Kemenczy, and Ben Babbitt. We're currently working on Kentucky Route Zero, a magical realist adventure game about a secret highway in the caves beneath Kentucky, and the mysterious folks who travel it. Acts I-IV of Kentucky Route Zero are available now. 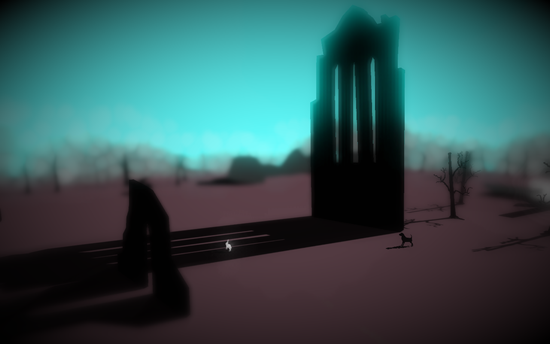 Ruins is a game about a dog chasing rabbits through a shadowy, dreamlike landscape. This is a very short game (and some pathways are shorter than others), but it’s also not possible to see all the content in a single play-through. I’m not sure what the minimum system requirements are for this game, but it’s a bit more graphically intensive than the other’s I’ve done. Apologies if it doesn’t run smoothly on your computer! It runs very smoothly on my Macbook which is about a year old, if that’s any help.